Obituary for Norman Carrier | Grays Funeral Chapel LTD. It is with deep sadness the family of Norman Edward Joseph Carrier announce his passing, with his family by his side on April 12, 2019 at the age of 62 at St. Paul’s Hospital, Saskatoon, SK after his battle with cancer, diabetes and COPD. Norman was born on March 31, 1957 to Eugene and Yvonne Carrier at the Holy Family Hospital in Prince Albert, SK. He was the middle child to 2 brothers and 1 sister. Norman lost his hearing at the age of 9 years due to red measles. After 9 surgeries he continued to fight with his hearing and it ended being a lifelong battle, but never stopped him from making friends and keeping the crowd laughing. His humor was one of his finest traits. Norman was an original West Flat Boy he attended St. Paul’s and later St. Mary’s High school but while not in class you could find him somewhere in the flat playing sports, hanging with his friends and later raising his family. Norman started his career working for Ted’s Cartage. In 1978, he was then employed by the City of Prince Albert and was provided many jobs titles and departments, but it all began in the Waterworks department. 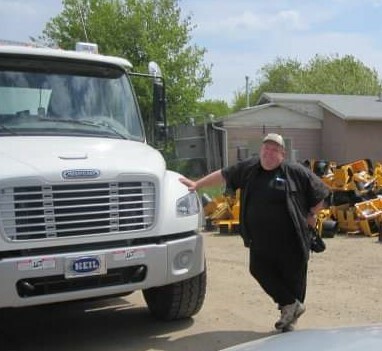 In his various positions throughout the years with the City he would always leave a trail of his humor and friendships ending his time there driving garbage truck which he loved. Norman met Marlene Labiuk in 1979. After a short courtship, they were married on July 26, 1980. Together they raised three children – two girls, Carmelle and Crystal, and his boy, Jeff. Norman enjoyed socializing with his family and friends, also passed his time hunting, fishing, and camping. He loved men’s slow pitch and played on the PEPSI team. He continued his love of the game by becoming an umpire until 2002 later he went on disability in 2010 this kept Norman close to the game and in a circle of friendships lasting a lifetime. Norman had a gifted sense of humor and maintained it until his passing. Norman leaves to mourn: his wife Marlene Carrier; his daughter Carmelle Carrier (James Fraser) and children Lindsay Carrier and Blake Watson; daughter: Crystal Carrier and her children Natalie and Samantha Donald; his son, Jeff Carrier; his brothers Marcel Carrier and Denis (Sandra) Carrier and numerous nieces and nephews and friends. Norman is predeceased by his parents Eugene and Yvonne Carrier, his parents-in-law Bill and Mary Labiuk, his sister Denise Burley, his son-in-law Kevin Donald, his brothers-in-law Richard Labiuk and David Labiuk, his nieces Kim Sorenson and Kyla Labiuk, his grandparents Augustive and Dora Carrier and his fur baby Molly. Norman also leaves his fur babies Bella, Penny and Buddy. A Celebration Of Life will be held at Parkland Hall on Thursday, April 18, 2019 at 1:00p.m. 1510 9th Avenue West, Prince Albert, SK . A private family interment will be held at a later date. For those so wishing condolences in Normans memory can be made to Hearing Life, 16-1945 McKercher Drive ,Saskatoon, SK S7J 4M4. Condolences may be sent to the family at www.grays.ca. Funeral arrangements have been entrusted to Gray's Funeral Chapel.